For me personally it is not so much what, but more who. I stumbled into the trade after a rather tumultuous three years of university and was oblivious to what the role of a winemaker entitled, fortunately for me I had the privilege of working under Duncan Schwab at Sharpham. He instantly gave me responsibility, instilled confidence in my ability to do the role and was a top boss. Seeing the success he has achieved and the respect he has throughout the wine industry first hand, coupled with the big old grins on the customers faces after consuming the plonk that he created has just inspired me one day to achieve similar things. I see my career in winemaking as a series of chapters. It has a rather humbled beginning where I was fortunate enough to get offered trial work at Sharpham after meeting Duncan the head winemaker after a game of squash (me being the gent I let him win because I wanted the job). Initially at Sharpham, I was working unpaid and was mainly labelling and cleaning - not much has changed. 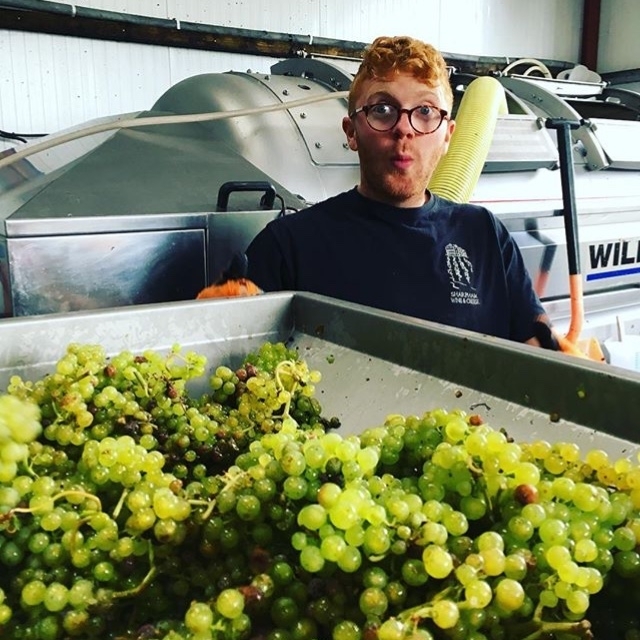 After a summer of mucking in at the winery, I embraced my first harvest at Sharpham, completely unaware of what was coming my way, needless to say I loved every second of it, 2014 was a remarkably big year for the English wine trade, it was a baptism of fire but being the first vintage I look back on it fondly. After completing the harvest at Sharpham, I thought it would be a wise decision to embrace a harvest in the southern hemisphere. Due to a lack of experience, this proved difficult however I was fortunate enough to find a wwoof (willing worker on organic farms) job, again unpaid. This was for a biodynamic/organic producer called Small Fry in the Barossa Valley (on his farm I think he had a total of 15 grape varieties most of which my inexperienced self had not even heard of, let alone work with). I loved my stint at Small Fry and it was one of the greatest insights into making wine I have witnessed. Natural ferments, skin contact white wines, Pétillant-naturel and all sorts of wicked reds being produced, after this I was hooked. Here I was also taught one of the greatest winemaking techniques I am yet to learn - 'great wine is made with good beer' by the head winemaker Wayne Ahrens who is a true legend and I adore his ethos to life and wine. After completing these two vintages I realised that I could do this for a job. After Australia, I came back to rural Devon and completed 2015 and 2016 harvests with the merry band of colleagues, this was a two year stint at Sharpham uninterrupted and afforded me the luxury of learning the process of making a wine from start to finish and picking the brains of Duncan who is the mastermind behind one of Englands finest ranges of wines. During this period I honed my skills in the lab, vineyard and winery which is the beaut of working within a small team, you get to be involved in all manners of production. This chapter was pivotal and has put me in good sted. There is the obvious of making some internationally and nationally award winning wines but I think the personal highlight for me has to be the people I have worked with (puke). I have had the joy to work with people from Europe, Africa, Australia, NZ, Japan all of whom were different but I still keep in contact with. It is hard to do the job sometimes but doing it with friends and people up for a laugh makes it all good and there has been a lot of laughs. What is the point of making something so tasty if you have no one to drink it with? 'Don't funnel those two bottles of cheap Sauvignan Blanc Charlie, it may hinder you ability to appreciate wine in the future' also..' 'Caustic soda crystals cause a lot of pain when exposed to skin'. It would probably have to be the Pinot Gris Wild Ferment from the 2017 vintage, a wine made with minimal intervention, no cultured yeast and even allowing the juice to have a little flirt with skins for a period of time has created a wine that has an increased structure and depth, not your typical Pinot Gris but sure is exciting. I really like this grape variety used well and not just thrown into a bottle, think you can really reap the rewards, just look towards the Southern Hemisphere for some belters of examples. 2. First proper encounter of an English Blanc de Blanc and it was joyous and then set the bar for all comparisons. Sharpham - 2007 Bacchus - Rummaging through someones wine cellar always throws up a delight or two, let alone a wineries. At Sharpham we thought it would be good to sort through the cellar, so had to taste the previous vintages; a real chore. This 2007 Bacchus was a joy to behold, still holding its freshness with an added elegance and depth think the residual sugar helped to keep it together. Being an Englishman in the English wine trade where the common belief is 'drink white wine young' it was a welcome surprise to find something with a bit of age knocking all those young boys off their perch. DO A HARVEST!!!! Not necessarily in England, but experience it, it is the best time of the year and if you enjoy it stay in it. It is a trade like few others it offers you the opportunity to travel, meet people from all over the world, all walks of life whilst working and getting paid for doing a job that is extremely rewarding and you are going to have a laugh and probably a few singalongs during the way. Plus your next drink is never to far away from you, just open the tasting valve on the tank.....make sure though you work in a place with a sound system.